Air Star Incorporated offers a wide range of products and services that cater to the oil and gas industry. Our company was established circa 1984 with our founder Tony Drake working mainly out of his truck while his wife Lorraine kept the books. Initially, the upstart field services company repaired and calibrated mostly instrumentation and controls. 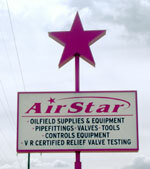 Air Star then expanded into new valve sales in 1995 and added a full service valve repair shop. We have been V.R. Certified since 1999. (If you are a pipeline or a lease operator, you can find our operator qualifications (O.Q.) and statistical data on ISNetworld. 2005 marked another milestone in Air Star’s history by opening a retail shop along the Bloomfield Highway. With over 12,000 square feet of warehouse, it is hard to miss now that our bright pink sign is up! if you are searching for your PRV & Greasing Reports on our database, please log in on the lower left hand corner. Requires username and password. If you have misplaced yours, contact: caridrake@airstarinc.com.